The Vibration and Acoustics Laboratory Vibration is a 640 square feet laboratory for research and educational activities. The laboratory offers opportunities for hands-on, project-based learning and is used in the Mechanical Vibrations (ME101), Advanced Mechanical Vibrations (ME401), and interdisciplinary Acoustics, Vibration and Noise Control (EID160) courses. 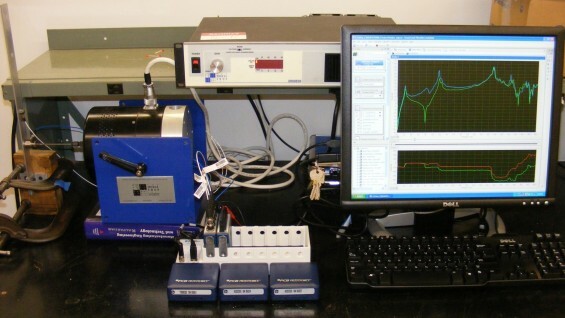 The laboratory is used in the Mechanical Vibration courses so students gain practical experience with accelerometers and data acquisition to characterize dynamic properties of structures. In the Advanced Vibration class, students perform experimental modal analysis via impact hammer and shaker testing to predict, troubleshoot, and/or optimize structural response characteristics. Examples of past student projects include: comparing wooden and aluminum baseball bats, determining the sweet spot of a hockey stick, analyzing the structural properties of an engine test bed, and studying the vibration of subway cars. Extensive testing equipment and instrumentation includes various modal impact hammers, ICP force sensors, signal conditioners, five electrodynamic shakers, and PCB Piezotronics and Bruel & Kjaer seismic, tri-axial, and uni-directional accelerometers. 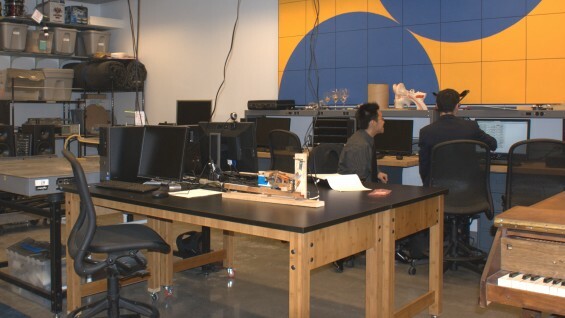 The laboratory is equipped with LabVIEW software including the Sound and Vibration Suite, National Instruments data acquisition devices, seven PC computer workstations, one MAC workstation, and two laptops for remote data acquisition. In 2010, a grant from the Brooks Family expanded the testing and data acquisition capabilities to include a state-of-the-art, 16-channel LMS SCADAS data acquisition system. The Vibration and Acoustics Laboratory includes a 520 cubic foot full-coverage anechoic chamber, sound level meters, and Bruel & Kjaer and PCB measurement grade microphones. Various audio and sound analysis software and equipment, such as ProTools MBox computer audio workstations, 5000W JBL Professional sound system, and Mackie studio monitor and console, facilitate research projects in acoustics, audio, and music. The laboratory offers opportunities for interdisciplinary projects with engineering, art, and architecture. Current and past projects include environmental noise studies, troubleshooting HVAC noise problems, architectural acoustics, and musical instrument design. The laboratory also serves as a design studio for the Interactive Light Studio, an outreach project where students are working to create a digital projection system and animatronics that respond to sound for installation at a New York City public school for deaf and hearing children.